Is anyone else slightly concerned about the absence of commentary on the Science and Society National Science Challenge? Early discussion amongst society on new technologies to develop the social licence and agree boundaries. Well, as some more astute readers have noticed – it is now August; and to the best of my knowledge approximately NOTHING has happened on this challenge since May. * In that time, the other challenges have all held several meetings and workshops with leaders from their respective fields. Some even appear to be making progress**! I could hypothesis why this is the case until I’m blue in the face but there are some glaring reasons why scientists might have more pressing concerns than this, as a physics researcher pointed out to me on twitter last week. 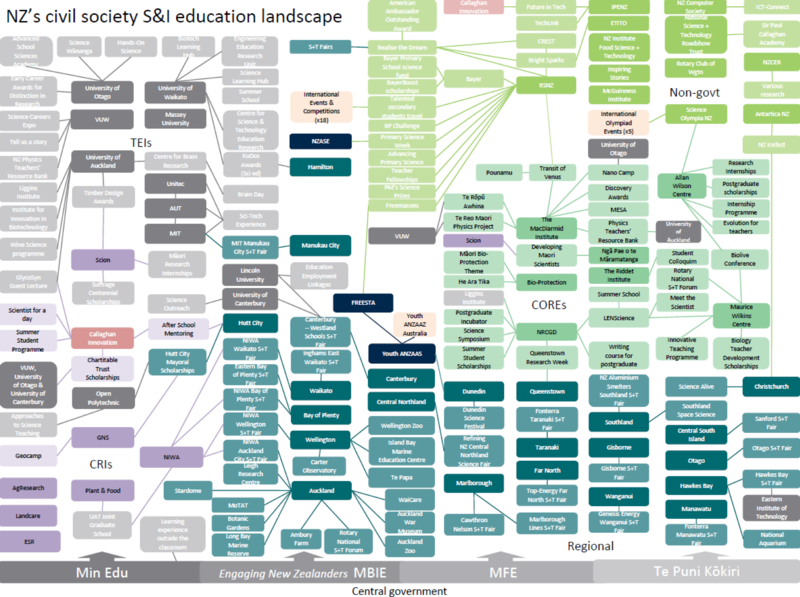 It could simply be that this challenge requires dialogue with a huge number of diverse groups – the image above attempts to name and connect the organisations involved in public science outreach across New Zealand (kindly provided to me by MBIE). I’ll freely admit that this is a complex and often high-opinionated landscape – but it’s also one that’s united by a common cause. Surely expecting a simple statement of intent or movement over almost 4 months isn’t too much to ask? Not when individuals are willing to volunteer their time to make this move forward? Which is – in part why I’ve been feeling so uncharacteristically pessimistic about the future of science in New Zealand recently. But once again – it’s New Zealand fantastic teachers, scientists and students that have bought me out of my gloom. 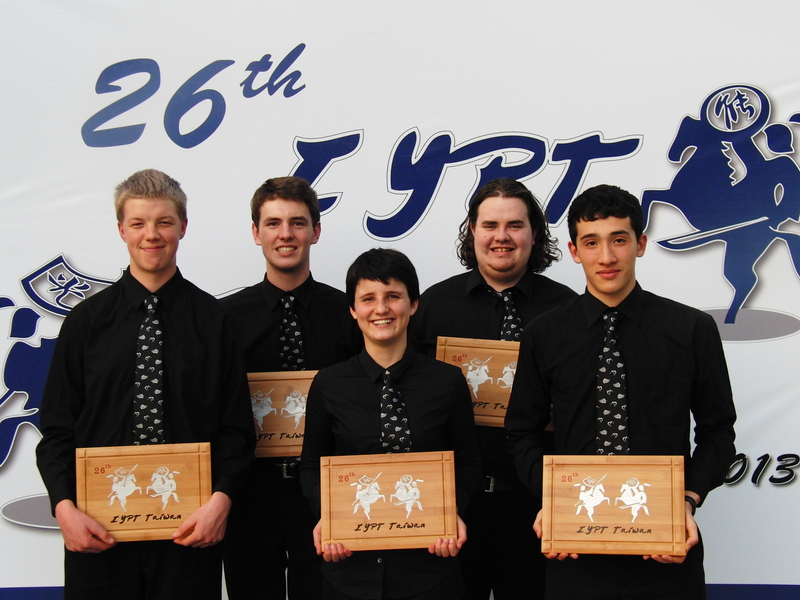 Firstly a massive congratulations to the New Zealand team in the international young physicists tournament who were awarded a silver medal for their 6th placing in the 2013 held in Taipei. If you need confidence in New Zealand’s ability to produce top quality scientists and engineer you need look no further than this team – and of course the support they received from their teachers, a certain blogger, and scientists at Callaghan Innovation even whilst in the midst of an pretty extensive restructure. Then there are the phenomenal candidates who participated in this year’s Eureka! Sir Paul Callaghan science symposium. The eventual winner – Evan Brenton-Rule spoke about managing New Zealand’s invasive species – but all the participants are well worth watching. On there’s the fact that currently there’s a space telescope mounted in a freakin’ PLANE operating out of Christchurch. And the NZ skeptics conference and Carter Observatory get to host astronomer and podcaster Pamela Gay at their 2013 conference on September 6th-8th in Wellington. With all this going on (and of course much MUCH more) – it difficult to stay pessimistic about the relationship between science and society in New Zealand. Of course we can do much better – and we should certainly strive to – but perhaps a simple way for us to start is to acknowledge the science culture we have bubbling out of the woodwork already across Aotearoa? * Yes there’s a large element of ‘the pot calling the kettle black’ in this post since even I haven’t posted about it since May! And part of the blame sites squarely with myself for letting this lapse. ** Apologies for being bland and non-specific here. I can’t comment further on this until an official announcement is made. Rest assured I will as soon as one IS made. Doesn’t sound like the definition of early career researchers to me. Well said, Elf; to me this Challenge is perhaps the most important of all, so it would be good to see it begin to gain some traction.